It was such a great family weekend getaway. Not only was it a great trip but cheap too! Last weekend, I took my wife and two preschool kids to Deerland Park and Kuala Gandah Elephant Sanctuary – both situated in Lanchang, Pahang, Malaysia. I have never been SO CLOSE to animals. No, I am not talking about pets. I am talking about wild animals! Bears, deer, and even elephants. This is a privately run park. The park is owned by Abdullah Ahmad Maimun. The “featured” animals are bears and deer. You can see and touch and feed the animals. Hug the animals if you will. Another thing that amazed me is all visitors would be given a personalized tour around the park – no matter how big your group is. Even a family of four like ours was treated the same as one busload of visitors. The highlight of the tour is you are given a basket of cut sweet potatoes to feed the deer. The deer are well trained. Whenever they see someone holding a basket, they will ambush. When you feed, the trick is to hold the basket high above your head and feed one at a time with another hand. Nothing gets closer than this. Likewise, you can feed the bears. If you are adventurous enough, you can feed with your mouth as one of the Australian visitors did. She said the bear was a great kisser. But there was one downside. 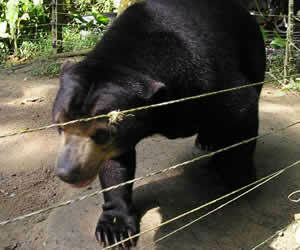 My kids were scared of the “intrusion” of the animals. For them, the animals got too close for comfort. They are not used to touching animals and maybe are too young to appreciate animals… I mean wild animals that we only see on TV. But overall, they were having fun. The only animals that my kids dared to touch were rabbits. One of the staff was kind enough to let us in the rabbit compound and play with them. Other animals you’ll see in the park include hedgehock, monkeys, wild chickens, mouse deer, ostriches, and birds. We spent about an hour in the park at a leisurely pace. Opening hours: (except Fridays) 10.30am to 5.30pm. It’s a two-hour’s drive from Kuala Lumpur. Take the Karak Highway heading Kuantan. Get past Karak and take the Lanchang Exit (Exit 816). After the toll, take the right turn to Kuala Lipis and Raub. Go straight for about 6.5km, watch out for a signboard says “Deerland” and take the right turn. Drive for another 2km (it’s a narrow 2-way tarred road) to reach the entrance where you can get your tickets. First of its kind in Malaysia. This is another not to be missed place for animal lovers. At this elephant sanctuary, you can do three things: feed the elephants, ride on them and bathe (with) them. We didn’t know that there is a timetable for these activities to take place. Activities start at 2pm every day unless with special arrangement. We were lucky. We made it for the activities. Upon reaching, you have to register yourself at the office and sign Letter of Indemnity – you will not hold the Department of Wildlife and National Parks (Perhilitan) responsible for any injuries during your visit there. We reached the Sancturay at about 12.30pm. We missed the elephant ride as there are only 120 seats are given out each day. But the rides for children are still available. However, my kids are not qualified as only children above 7 are eligible. There are 6 elephants, big and small, altogether. At 2pm, all the elephants will move to a nearby stream for a shower. I had a good time watching the elephants making a short parade from the enclosed area to the stream – up close. 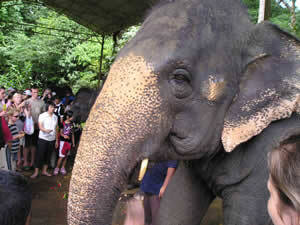 After cleaning up, the elephants are brought to a nearby shelter and are chained. This is where the feeding takes place. Visitors are briefed on the right way to feed the elephants. There are two ways to feed: through the trunk or direct to the mouth. You can get the food from nearby baskets which contain cut watermelons, sugarcanes, sweet potatoes, and bananas. Next activity is the rides. Adults and children are divided into two groups – because platforms with different heights are used. The ride takes you around a small circle. The last activity is bathing. Visitors can ride and play with the elephants in the stream. We missed this one as my kids had started to make noise as their routine was disturbed. We left the place at 3pm – heading Lanchang town for a late lunch. TIP: To make sure you have passes for the elephant rides, arrive early and register first. Get your passes and head on to Deerland Park as your first destination. Come back here after your visit to Deerland. Entrance fee: free! It took me exactly two minutes to recover from the shock after finding out that the entry is free. However, donations are welcome. All will be channeled to Elephant Trust Fund. Follow the directions to Deerland Park above. Instead of making a right turn to Deerland, go straight for about 2km. Kuala Gandah Elephant Sanctuary is located at the end of the road. For both locations, please call to arrange for accommodation if you plan to stay overnight. Word of Caution: During our trip there, the food stalls were closed. So we had to settle for some biscuits (which we brought from home) for lunch. You can get some snacks from a store in Kuala Gandah Elephant Sanctuary. We thought we could get a decent late lunch in Lanchang town. But when we reached there, the town has only two rows of pre-war wooden shophouses and not much food available then. We had to head home for an early dinner. For those who are the pampered lot, bring some food with you during the trip. Also bring plenty of water. You can actually picnic in a park outside Kuala Gandah Elephant Sacntuary office. Don’t forget to bring your camera or video camera when you visit. It’s a chance of a lifetime to get so close to animals. We had another great time watching those video clips at home.